Thirty-two years into the presidency of Paul Biya, Cameroon is weakened by social discontent and political deadlock. In the north and east, security forces struggle to keep at bay incursions by Nigeria’s Boko Haram and armed groups from the Central African Republic. With its security forces under pressure and tensions rising within the ruling party, the pillars of the regime have begun to crack. President Biya is giving no indication that this is his last term in office and no plans are in place to ensure a transition before or after the 2018 election. Neither the opposition nor civil society is strong enough to foster social and political change. In its latest briefing, Cameroon: Prevention is Better than Cure, the International Crisis Group examines the risk of violent transition and outlines urgently needed measures to prevent a conflict that could impact on regional stability. While relying on well-tried mechanisms to control the opposition, the regime bets on the population’s resilience. But in the face of high youth unemployment and corruption, social protests – so far limited – could turn into a violent uprising against the regime, led by an alienated younger generation. To reduce the risk of violent transition, Cameroonian authorities, the opposition and civil society need to reopen dialogue, negotiate a political and institutional reform package, and reach an agreement on a post-Biya transition, guaranteed by the African Union. 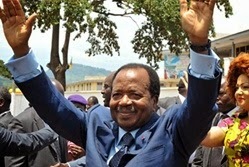 This agreement should include: 1) President Biya’s promise not to contest the 2018 presidential election in exchange for a guarantee that no legal actions will be undertaken against him and that he can retain his assets; 2) new appointment mechanisms for the members of the Supreme Court, the Constitutional Council and the electoral commission to enhance their independence; 3) introduction of age quotas to inject new blood into leadership structures and political parties; and 4) primaries for all political parties before 2018. “Cameroon needs a reality check” says Hans Heungoup, Cameroon Analyst. “With growing militant threats at its borders, the country can no longer afford political uncertainty, institutional fragility and the disenfranchisement of its youth”. “A badly managed succession could plunge Cameroon into a dangerous conflict and would prove detrimental for West and Central Africa by creating an axis of instability from north-east Nigeria to Central African Republic and South Sudan”, says Thierry Vircoulon, Central Africa Project Director. “Cameroon’s political establishment should put its disputes aside and agree on the fundamentals of what could be a post-Biya transition before it is too late”.